We hit a bit of a heat wave this summer. We’re always very aware of the need to keep our campers hydrated but this was a red alert situation, so we had to get creative. Here are two ways we made keeping our campers safe and healthy a little easier. We got the campers involved. 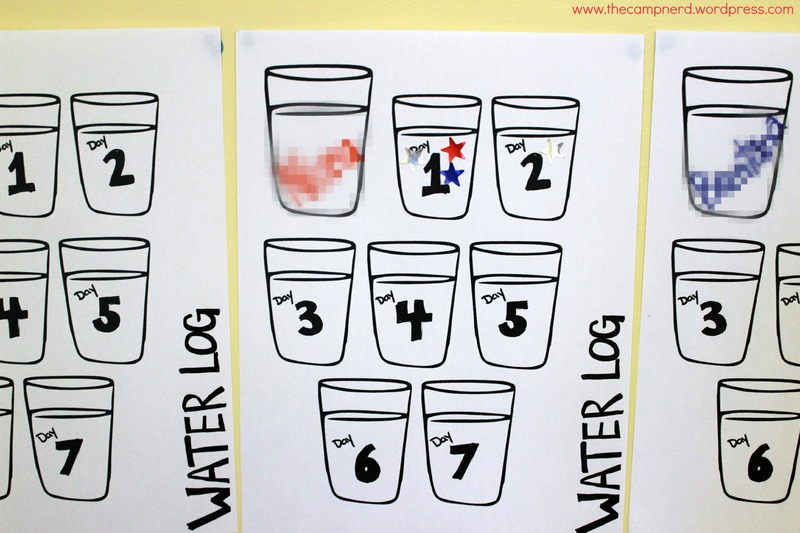 Donna created the template for the log then just photocopied it and wrote the camper’s name in the first glass. She hung them up in the dining hall, but you could hang them in the cabin, or any other high traffic area. There were stickers near by and campers put one on the cup that corresponded with the camp day each time they had a drink. It’s such a simple solution to a really important issue. The campers totally bought in, and the staff were sad that they didn’t have water logs too (ok, mostly me). I think this will be most effective with younger campers, but depending on how you frame it, it could really work with any age group. No problem, there are many other, more permanent ways you can make this work at your camp. You can create the system then just reuse with each group of new campers. Use a large white board, draw the logs on in permanent marker then fill in the camper name with erasable marker. 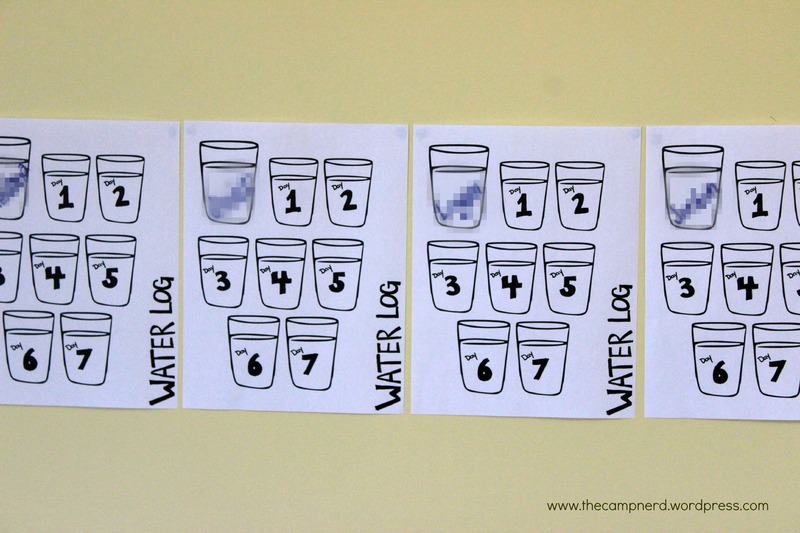 Have the campers draw a check mark, x, smiley face, or whatever to track their H20 intake. Then just erase and start over for the next session. Use a large chalkboard, draw the logs on in paint then fill in the camper name with chalk and to track their H20 intake. Use some thin craft wood for each sheet and use chalk to fill it out, or use some sticky tack and those little wooden shapes you can buy. Use felt or foam sheets, and have campers stick stickers on them (they come off pretty easy) OR use shapes cut out of the same material or purchased, with some sticky tack or velcro to keep them on. Use a combination of any of the above. Foam shapes will totally stick to a whiteboard with some sticky tack. Our other solution came from one of our head counsellors. The third reason is how we got this next idea. I asked some of the returning staff for ideas, one of those “if money was no object, what would you want for the camp” questions. One of the HC’s said “it would be really great if there was some sort of water station outside, so we didn’t always have to keep running back and forth with cups and water pitchers”. I took an old file cart that wasn’t being used anymore and added a Coleman water cooler on one side, a mesh bag for the used cups on the other side and a box underneath for clean cups. And voila, a super easy portable Hydration Station. You can’t tell in the photo, but the box closes to keep the cups clean while the station is being moved from point A to point B. Now something like this works great for my camp because we’re completely barrier free and accessible. We’re a small site with (relatively) flat, paved walk ways between each location because we cater to campers with disabilities and it makes their experience a whole lot more enjoyable when they can actually get to the places they need to be without a whole lot of assistance. So having this cart on wheels is a no brainer for us. Maybe your camp is a little more ‘rustic’; not all camps have paved walk ways, and those wheels wouldn’t do well with gravel, wood chips, or mud so you might want to come up with some solutions that work for your site. Use a sturdier frame (people are doing really cool things with pvc pipes these days), that combined with your new wheels will make you unstoppable! So there you have it. 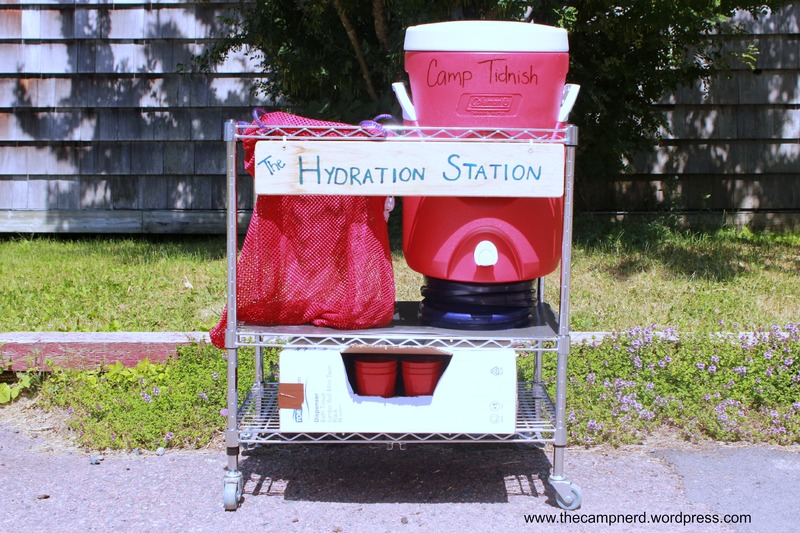 Some super easy, inexpensive ways to keep your campers hydrated, happy, and healthy. Also, I hope that another take away from this post is that we all need to be asking for ideas and input from our colleagues, they are FULL of amazing ideas, we just have to tap into that and it will make everyone’s camp experience so much richer. Do you have any tips or tricks to keeping your campers drinking lots of water? Tell me about it in the comment section below. “water log” tickles my need for a good pun. Great post, Patti!